Launching in time for Christmas in UK for people who appreciate holistic health and appreciate great oral care. Providing a stylish and affordable present (RRP 129.99) that also has a health benefit. It is aimed at fashionable, trendsetter people, and the families who demand more holistic and cutting-edge health. It offers a different way of cleaning to most of the electric brushes on the market, and comes in a handy ergonomic and lightweight product design that’s perfect for travelling with, and will fit into handbags for example. “ION-Sei represents a significant milestone for Sanyei (Deutschland) GmbH, with its first product launch into the oral care sector. “ said Mr. Yusuke Horiguchi, Managing Director, Sanyei (Deutschland) GmbH. “Not only are we bringing the best of Japanese Technology, but combining this with contemporary German design, creating a highly effective and elegant product” Mr. Horiguchi added, “the word ION-Sei translated from Japanese literally means “ionic nature”, so we have captured in the name the essence of the product’s unique technology”. ION-Sei uses a patented new technology by using UV light, a Titanium Dioxide (TiO2) rod and Water, generating electrons and ions that suppress the bacteria which cause plaque to develop. The regular use of the ION-Sei electric toothbrush inhibits bacteria build up so over time eliminating plaque. Conventional electric toothbrushes use mechanical brushing to remove bacteria, which can return within a few hours to generate further plaque deposits. ION-Sei’s unique technology provides a very effective teeth hygiene system that over time will reduce the bacteria build up that creates plaque. The result is teeth surfaces feel smoother for longer, creating a much more pleasant mouth feel for users. The sonic vibration provides the last part of the teeth cleaning experience, to help remove tooth surface debris. Sanyei wanted to create a visibly different design and using the combination of Japanese innovation with German product design, the final result is elegant, light weight and user-friendly. Toothbrushes are moving from being purely a functional product, to one which is more fashion orientated and suit consumers’ life-styles. ION-Sei provides a choice of 2 contemporary colours (day white and lake blue), the shade of each colour has been carefully chosen by Sanyei to complement a mood or life style. 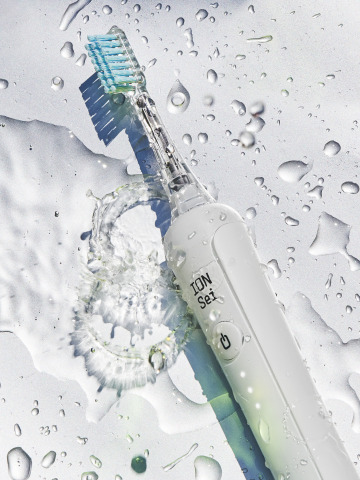 ION-Sei toothbrush head is soft and the brushing action gentle, so it is kind to your teeth, gums and mouth. The sonic action, coupled with the superior cleaning technology delivered by the ION-Sei technology delivers a highly effective clean gently, without the need for aggressive actions or hard bristles. Using the ION-Sei teeth cleaning system, the need to use toothpaste is no longer required, you can simply use water. The ability of ION-Sei to eliminate plaque and control the bacteria that cause it, does not require toothpaste. Toothpaste is really only needed to freshen the breath, due to the effective cleaning that ION-Sei delivers on its own. Established in 1946 and listed into Tokyo (JASDAQ) Stock Market in 1979, we, Sanyei Corporation, opened its first overseas base in Hong Kong in 1958. As one of the first Japanese companies to have adopted a business model that promoted global business, Sanyei provides seamless supply chain management both in name and reality and they take pride in being one of only a few leading companies engaged in the business of lifestyle-related goods. Sanyei has many years’ experiences in the production and design of small electrical appliances for leading brands. By using this experience and knowledge, Sanyei has developed its own unique technology for the ION-Sei electric toothbrush. ION-Sei is being launched for the first time Globally in the UK and Germany during the 4th Quarter of 2018 to coincide with the Christmas period. Currently available in the UK from Amazon www.amazon.co.uk at an RRP of £129.99. Brush head replacement heads (2 per pack) are also available at an RRP of £11.99. Sanyei (Deutschland) GmbH was established in 1969 in Düsseldorf, Germany, and is the European Headquarter of the Japanese group, Sanyei Corporation. Sanyei (Deutschland) GmbH handles this brand in Europe mainly.